Depositing money into your online casino account has never been easier nowadays. Top casino sites offer a multitude of different options, with some being dedicated to deposits only whilst others will allow you to use the same method to withdraw your winnings as well. Payment options will also vary between casinos based on their gambling laws, so it is always a good idea to check the casino’s cashier page to see which deposit methods are and aren’t catered for. What are the different types of deposit options at online casinos? Card payments are undoubtedly one of the more popular methods available due to being universally accepted and trusted. They can be used for both deposits and withdrawals, and are normally subject to bank charges. Credit Cards such as VISA, MasterCard and Amex. Debit Cards such as Visa Electron, Switch, Laser and Visa Debit. PaySafeCard - a pre-paid card solution that can be topped up at participating retailers. Entropay - a virtual pre-paid credit card that can be funded with a variety of credit and debit cards. These types of transactions typically take a bit longer to process but are ideal for making large deposits. Wire transfers can be used at a small fee for deposits and withdrawals, while other transfer methods may be restricted to deposits only – check the casino’s cashier page beforehand to make sure. Wire transfers - direct transfer to and from your bank account. Instadebit - bank wire transfer method for Canadian players. Bitcoin - cryptocurrency method that is steadily gaining popularity. eCheck - works like a virtual check payment for Canadian players. iDeal - popular transfer method for players from the Netherlands. iDebit - iDebit connects consumers to their online banking directly from checkout. E-wallets are extremely popular due to being quick, convenient, cheap, and very discreet. 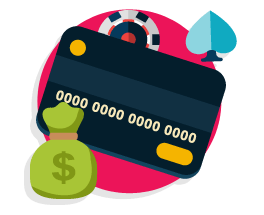 Some methods like PayPal can be used to both deposit and withdraw, while others can only be used for deposits (again, check the casino’s cashier page to find out what is allowed). We take an in-depth look at these types of transactions in the next segment below. What are web wallets and their pros and cons? A Web-, Digital-,or e-wallet is an electronic program that enables users to store an amount online, protected behind a password, and manage all their online transactions safely and instantly via one account. Because the use of web wallets eliminates intermediate services, such as a cashier for example, it is less costly for the consumer. Electronic transactions take mere seconds and can be done on any smart mobile device, making it highly convenient and time saving. Through the use of passwords and other safety features, web wallet transactions are extremely secure. Sensitive information is not disclosed to third parties, allowing for greater user anonymity. Records of all transactions are kept, making it easy for expenditure to be tracked. Businesses that make use of digital account technology have a competitive edge in the marketplace. People who often travel internationally can be restricted from using their web wallet in a different country. System malfunction and outages is an ever-present risk as user information is stored on the cloud of business servers. Digital wallets are accepted by limited number of merchants. The service cannot be used off-line. Web wallets are vulnerable should the user’s device be stolen and the password hacked, making the danger of losing money an unfortunate possibility. An equally varied amount of similar options exists when it comes to withdrawing casino winnings. Restrictions and fees do however apply, and can differ from one withdrawal method to the next. These include things like the amount of days players would need to wait until funds are cleared into their account, and the allowed minimum and maximum amounts that may be withdrawn per week / month. These restrictions will usually clearly be stipulated on the casino’s banking page. Regulated casinos secure their sites through the use of digital encryption technology. As a matter of interest, encrypted web page urls will always begin with “https://”. In layman’s terms, what this means is that the communication link between the casino site and user’s internet browser is protected. There are two types of security protocols casinos use to protect sensitive data, namely SSL (Secure Sockets Layer) or TSL (Transport Layer Security). Both employ bit keys that encrypt data, making it almost impossible to decipher and gain access to. KYC stands for Know Your Customer and it involves the process of verifying customer information. KYC documents generally include proof of identification and address, and casinos have the right as part of their banking regulations, to authenticate all customers prior to payment or whenever they deem necessary.